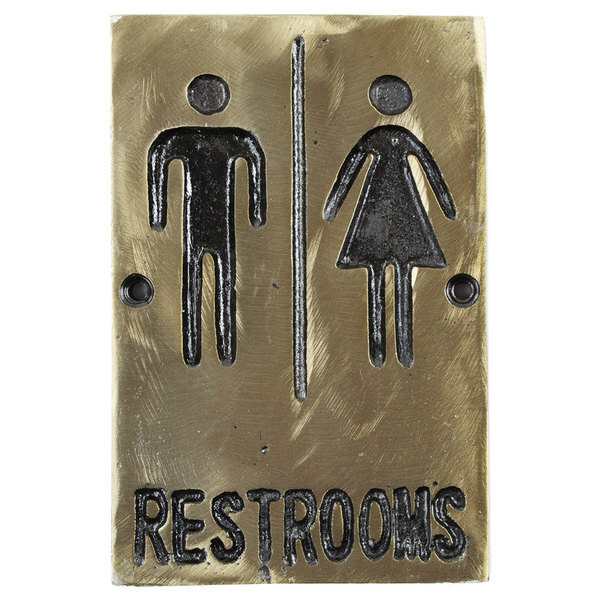 Tablecraft 465633 Bronze Unisex Restrooms Sign 6" x 4"
Make your message as chic as your restaurant or hotel with this Tablecraft 465633 6" x 4" bronze restrooms sign! Made with a durable bronze plate, this sign incorporates great color contrast that is vibrant enough to assist your patrons and elegant enough to complement your restaurant or hotel's interior. 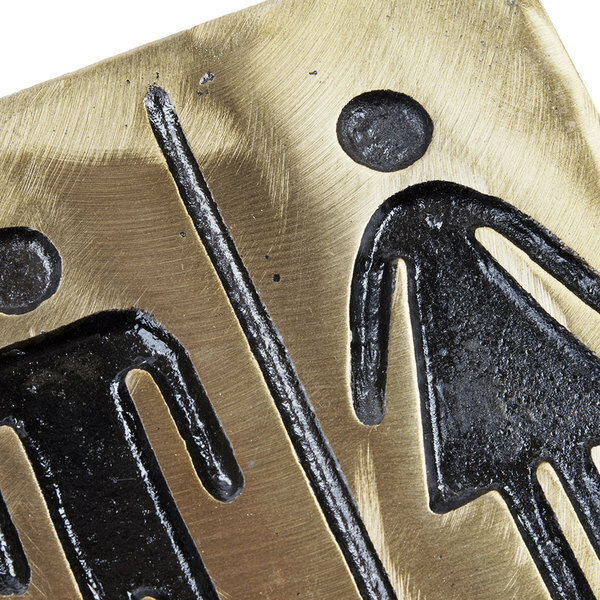 The etched black capitalized lettering allows your customers to see and read this sign from across a room or hallway and for those who may have trouble reading, male and female symbols are posted at the top. This lightweight sign is also easy to clean and transport, which makes placement effortless. You can simply mount it on a wall or door with the included hardware. 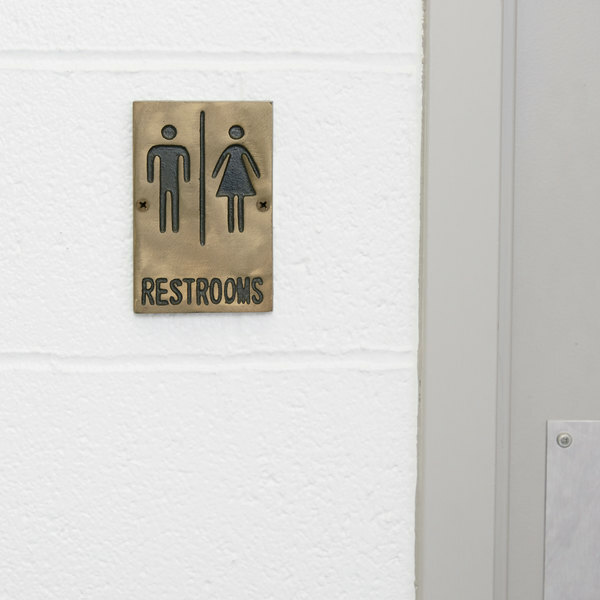 By hanging this sign near your restrooms, you can ensure that all of your customers know exactly where they can freshen up after enjoying a meal. Men's Restroom Sign - Black and White, 9" x 3"
ADA Men's Restroom Sign with Braille - Blue and White, 9" x 6"
Tablecraft B14 No Smoking Sign - Stainless Steel, 5" x 5"
This Is A Smoke-Free Restaurant Sign - Black and White, 9" x 3"
Tablecraft B13 Employees Only Sign - Stainless Steel, 5" x 5"
ADA Women's Restroom Sign with Braille - Blue and White, 9" x 6"
Tablecraft B11 Women's Restroom Sign - Stainless Steel, 5" x 5"
Tablecraft 394586 Solo Empleados / Employees Only - Black and White, 9" x 3"
Tablecraft 394567 Black and White Women's / Damas Restroom Sign - Black and White, 9" x 3"
Tablecraft B12 Stainless Steel Unisex Restrooms Sign 5" x 5"
Tablecraft B10 Men's Restroom Sign - Stainless Steel, 5" x 5"
Tablecraft 394566 Men's / Caballeros Restroom Sign - Black and White, 9" x 3"
Women's Restroom Sign - Black and White, 9" x 3"
Tablecraft 394589 No Fumar / No Smoking Sign - Black and White, 9" x 3"
Black and White Unisex Restrooms Sign 9" x 3"
Employees Only Sign - Black and White, 9" x 3"
ADA Handicap Accessible Sign with Braille - Blue and White, 9" x 6"
Tablecraft 394564 No Smoking or Vaping Sign - Black and White, 9" x 3"
Handicap Accessible Restroom Sign - Blue and White, 9" x 6"
Handicap Accessible Sign - Blue and White, 9" x 6"
Handicap Accessible Women's Restroom Sign - Blue and White, 9" x 6"
Restrooms Sign - Black and White, 9" x 6"
ADA Men's Restroom Sign with Braille - Black and White, 9" x 6"
No Smoking Sign - Black and White, 9" x 6"
ADA Women's Restroom Sign with Braille - Black and White, 9" x 6"
No E-Cigarettes Sign - Black and White, 9" x 3"
Handicap Accessible Men's Restroom Sign - Blue and White, 9" x 6"
Overall User Rating: Tablecraft 465633 Bronze Unisex Restrooms Sign 6" x 4"
Haha! 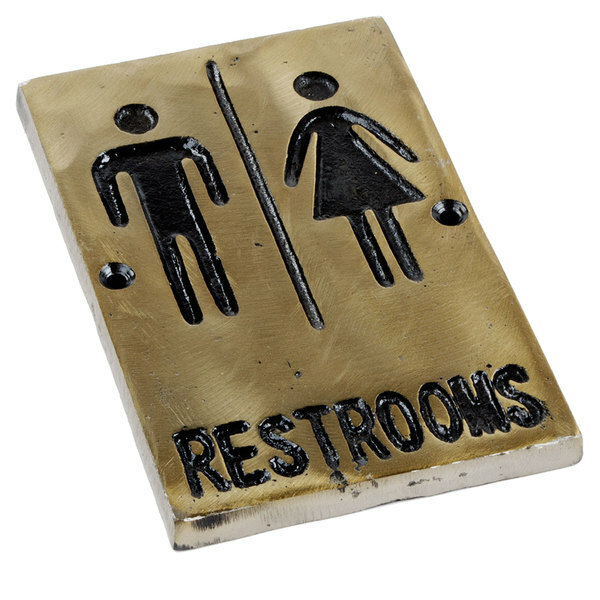 Cool looking bronze unisex restrooms sign. Love it! The only complaint would be that I wish it came in a larger size. 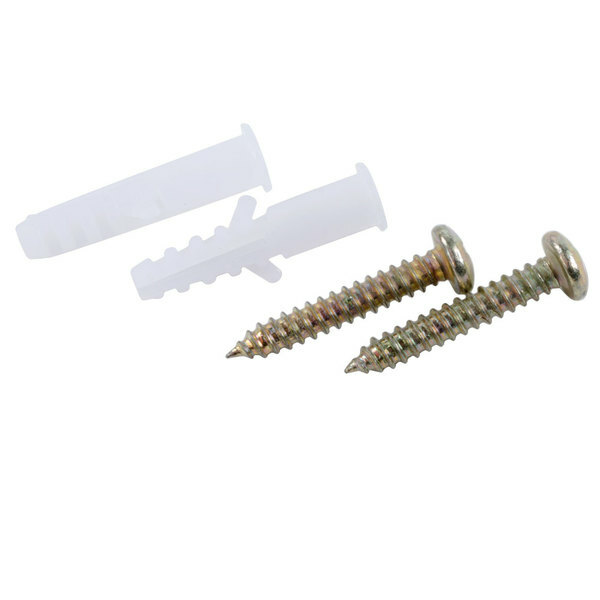 It came with the screws which you do not need to figure out what size screws will fit through. 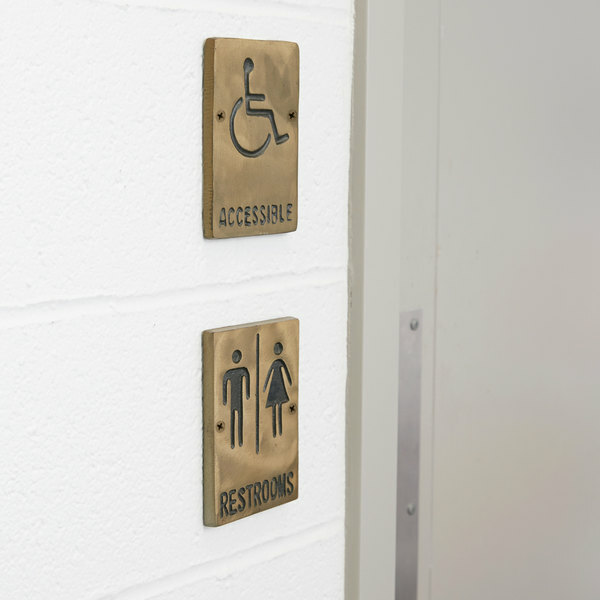 The Tablecraft restroom signs in bronze are a great change from the typical blue or black bathroom signs found in most commercial settings. A cute way to acknowledge where the bathrooms are! This sign is great if you are looking for something that isn't the typical one. 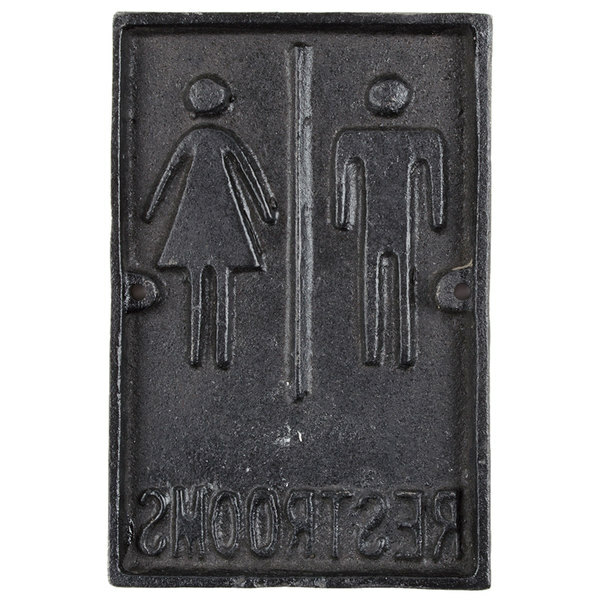 It has both men and women on it so it's to be used for a shared bathroom. Nice bronze color. Wipes clean with a rag. This is the most fab Bathroom sign in town. I really love it and was very impressed by the weight of this product. This item is very classy and you will get a lot of attention from it. Found this on another site and the cost was a lot higher! Was so excited to see that The WEBstaurant Store had it here and for soooo much cheaper because this little sign has a lot of personality. Looks so good in our cafe and just adds character. The sign is heavy and well made and easy to install. This sign adds a nice touch to our cafe. 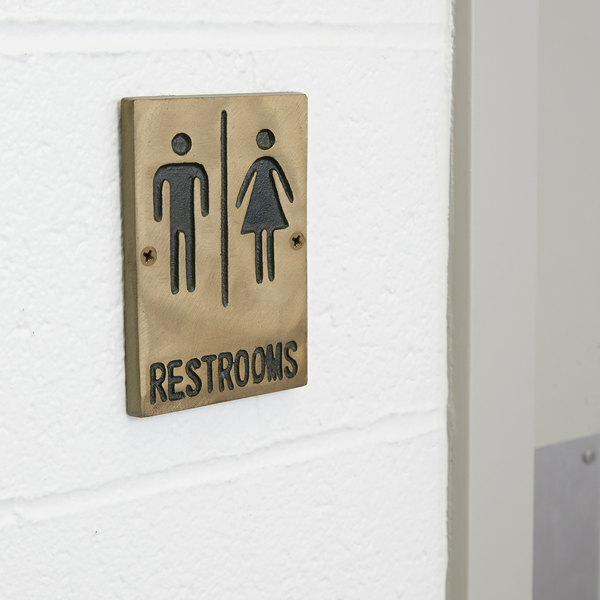 You have to have the standard plastic sign with brail but we placed this one on the door too reminding customers it's family restrooms. This restroom sign is small. But it looks much more appealing then the typical dark brown plastic ones. Has a more appealing look than most restroom signs.